When I was younger, I was never really into St. Patrick’s Day. Unless a shamrock shake was involved, I could take it or leave it. However, since having kids I try to make each holiday, big or small, a little special in some way for them. 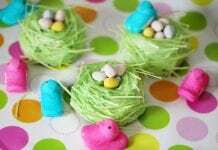 This could mean doing fun crafts like this Easter egg one or making some sort of fun food. St. Patrick’s Day is no exception to that rule. In my yummy, color food repertoire I have a few green food staples for the holiday, but I’ve found that it’s been fun to add to it year after year. 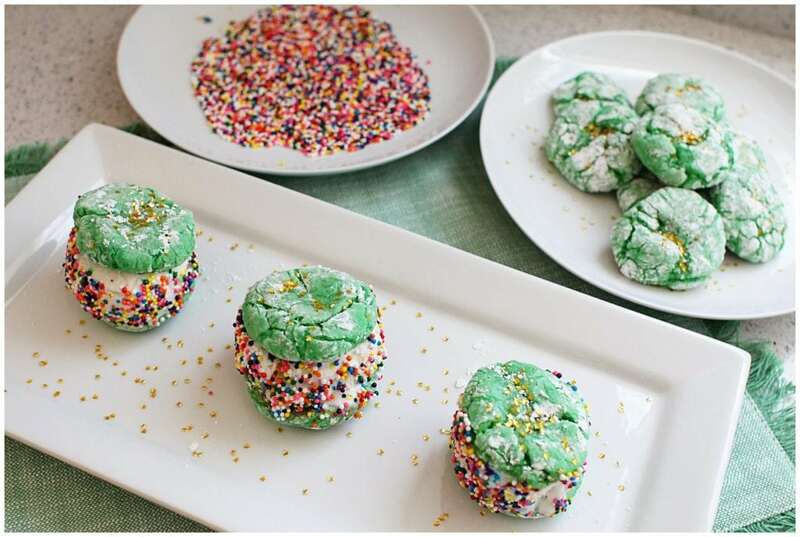 This year I created some simple, mint crinkle cookies and then made them into rainbow sprinkle ice cream sandwiches with edible, golden stars (You can find those here.). They’re not healthy, they’re just fun and I have no problem with my kids having fun food for days that are supposed to be all about fun. If you’ve made crinkle cookies before you know they are one of the easiest cookies to make because they’re essentially dense cake bites. 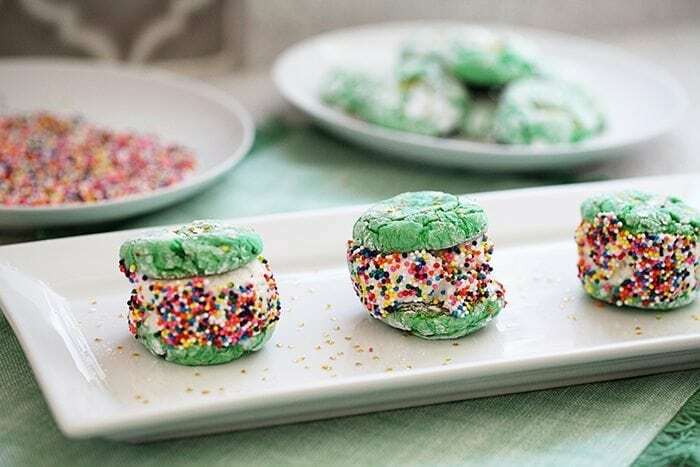 I turned them into little ice cream sandwiches that you can make and freeze to use for later that day, which is perfect if you want to make them when the kids are at school or make them for a party at your house. 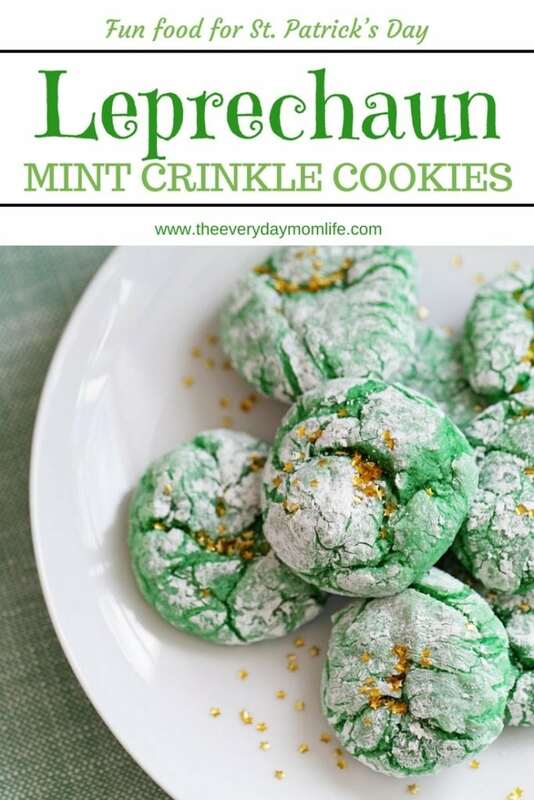 The full recipe for these little, mint Leprechaun Crinkle Cookie Bites is below! Combine your cake mix, melted butter and eggs. Mix well. Add your extracts and green food coloring and mix until well combined. Use a melon baller (or just your eye balls) to separate dough into little balls. Then roll those in the powdered sugar mixture and place on a cookie sheet. When done remove from oven and allow them to cool on a cookie sheet. Sprinkle them with the star sprinkles. Once cooled, scoop out ice cream with a small ice cream scoop or use the melon baller again. Then roll in a plate of sprinkles. Place in the freezer if you want to save these for later that day. TIP: The crinkle cookies are a smooshier (technical term) cookie so make sure your ice cream is softer when you make these but firm when you eat them. I hope your little leprechauns love these! I promise the cookies are simple to make and they always turn out. You don’t have to be an expert baker to make these and make them delicious. 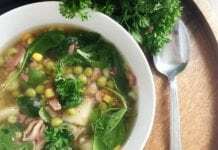 For more recipes from The Everyday Mom Life, click here. This looks amazing AND delicious! Saving it for next week. These cookies look beautiful and yummy. I would love to have one right now. these are absolutely adorable – especially the gold sprinkles are so cute – I love any chance to be festive! I love these – so festive! And I agree – it’s great to have fun treats on festive holidays; for kids AND adults 😉 . 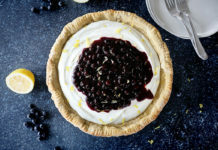 Gretchen Rubin (the author of the Happiness project) always makes a point to celebrate minor holidays with fun treats like this, because it makes the day that much more special. Thanks for sharing! I didn’t even think about celebrating St. Patty’s with my kiddos – what a fun idea! Thanks for the tip…and yummy looking cookies! These cookies look absolutely delicious. I bet my kids would love to make this with me. Those looks so cute and easy to do. I know my niece and nephews would like this because they love mint. Yummm these look delicious, going to have to make these next weekend! Man… I needed this recipe last year for the st. patty’s day potluck I went to! I am not a fan of mint flavored dessert but these cookies sure look delicious! these are ADORABLE!!!! love the green and the sprinkles. perfect for St. Patty’s day! Mint cookies? YES PLEASE! This recipe is a must try especially since it’s also something that the kids will enjoy. I love that it’s not difficult to make either! Those are too cute! I think the little AND the big leprechauns around our house would love them. I never knew you could buy edible gold stars, either. They add the perfect finishing touch! I love chocolate crinkle cookies and these look just as good! My son’s birthday is on St. Patrick’s Day and his favorite color is green. 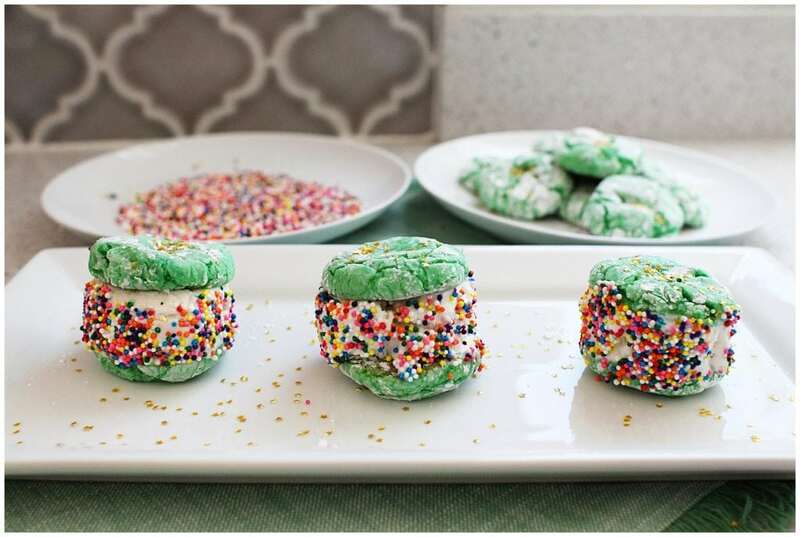 These would be a perfect birthday party treat and I love the idea of making them into ice cream sandwiches! These are so perfect for St. Paddy’s Day! Do you have a version from scratch? these are so festive and cute! I bet they taste good! 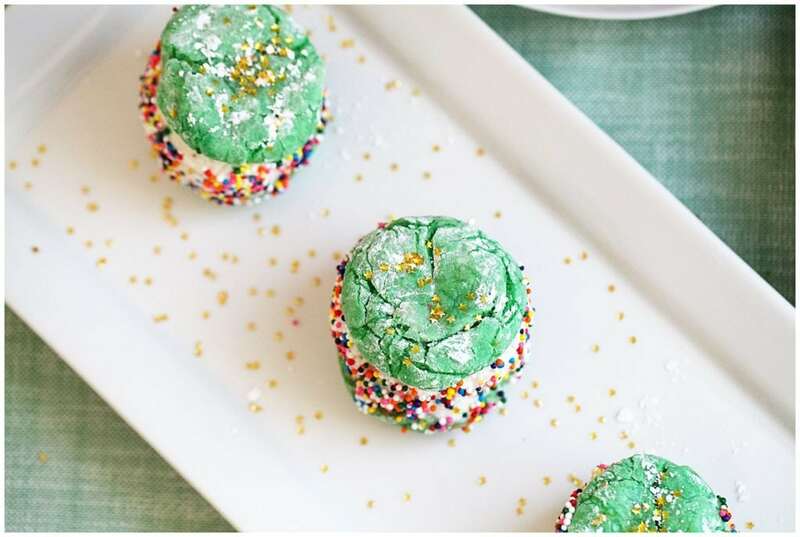 These look so good and fun for St. Patrick’s Day! I’ll take one of those ice cream cookies! These cookies look soo good! I love that you added sprinkles. Makes them look even more festive. These cookie bites are so cute and colorful! They are almost too pretty to eat. those cookies look really delicious. I cant believe st patty’s day is so close, the month is really flying by. Cake mix did you use?